Mehmet slams on his brakes as soon as he sees us huddled in the snowy blizzard. He’s as astonished to find us here, miles from anywhere in the coldest corner of Anatolia, as our last lift was when we told him to stop the car. 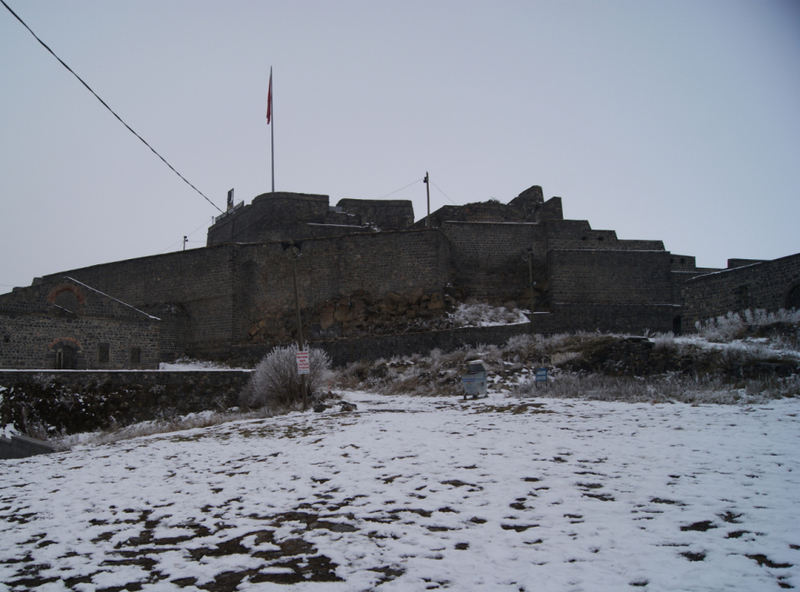 He had dropped us, astonished, by the place the road splits – just in time for Mehmet to see us. “Were you standing there long?” Mehmet asks me in Turkish, rubbing his hands together with concern. “About ten seconds,” I tell him, truthfully. The road climbs up and up into the winterlands. Mehmet points at the thermometer on the dashboard. The road outside is -12°. “In January it will be -30°”, he tells me. “Brrrr!” I say. Mehmet laughs. “Telephone?” Mehmet takes the hint immediately. I tell him that yes, I have the number, and he hands me his phone without hesitation. This is a routine I’ve been through a hundred times while hitchhiking in Anatolia, and it never fails to fill me with a warm glow. 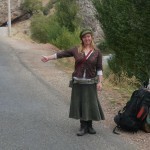 This is what hitchhiking will teach you above anything else: the world is full of wonderful folk. After introducing myself to our host on the phone, I pass it back to Mehmet, who asks for directions. He drives us right to our host’s house, in the centre of Kars. 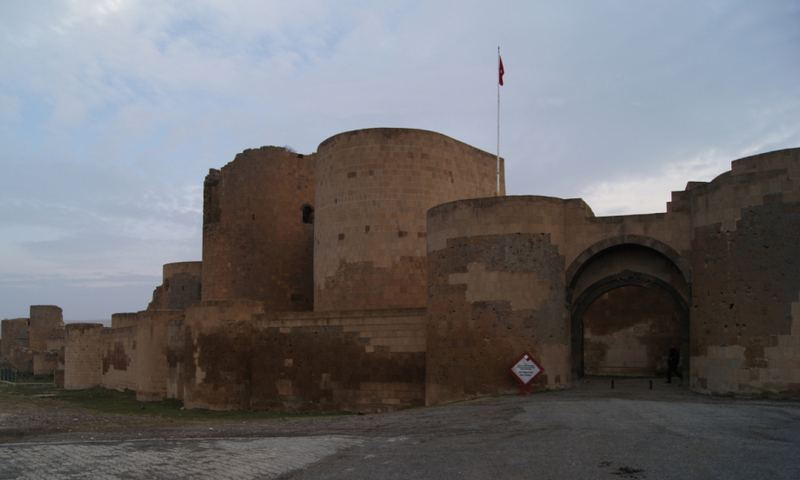 Although we only have three weeks left on Hrach’s Turkish visa, we’ve decided to stay three nights in Kars. This is because we have a mission here, and we know it could be tricky. 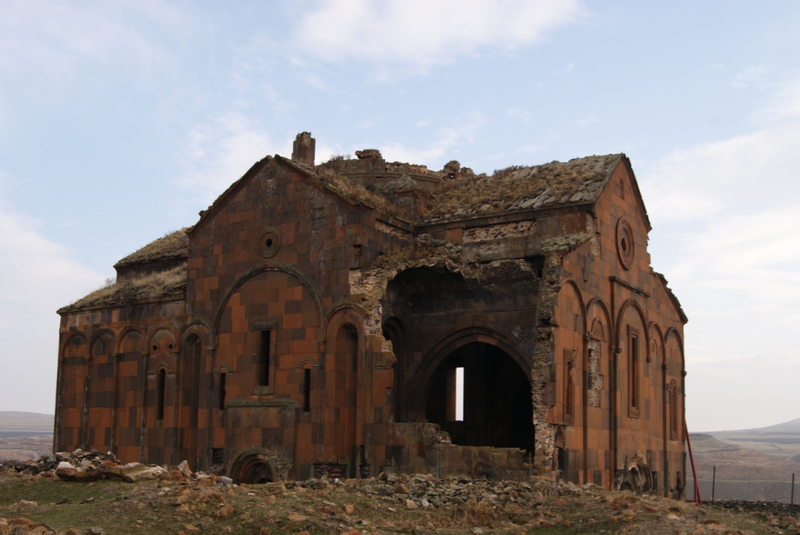 We want to go to Ani, ancient capital of the medieval Armenian Kingdom, which now lies in neglected ruins in a forgotten corner of Turkey, right by the Armenian border. This will be a tricky adventure for several reasons: the internet says the only way to get there is by taxi, it’s at the end of a forty-five kilometre road with only a few tiny villages on the way, and there’s thick snow all along the way. Our hosts both work, and so they have a nanny for their young son. Her name is Nursel and I love her immediately. 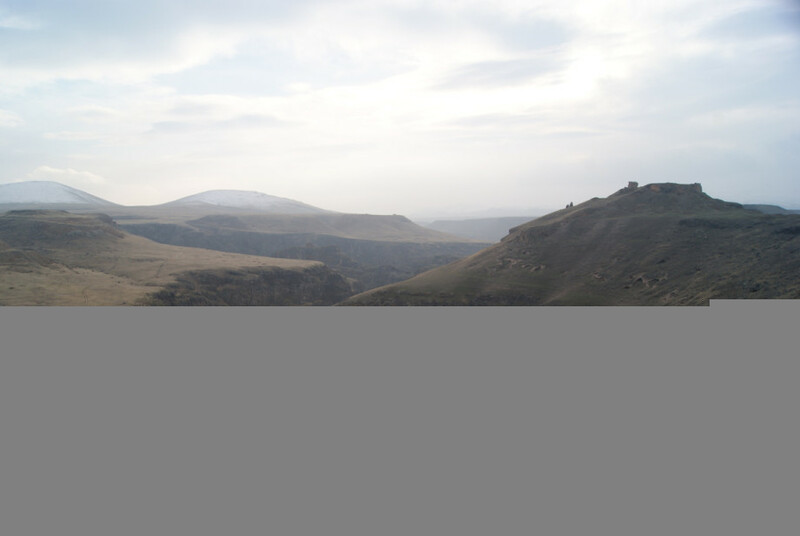 Nursel tells me a local’s secret: there is a bus to Ani, and it does run in the winter. The problem is that it’s a villagers’ bus and so it only goes one way, returning to Kars the following day. I find a few scant reports online of people successfully hitchhiking the road. We decide to chance it. We find the small minibus by the Halk Bank in the centre of town. There’s only one bus a day, and it leaves when it’s full, so Nursel said to get there before midday. The driver comes to greet us and shakes our hands. We tell him we want to go to Ani and he nods. He tells us the bus will leave in an hour and we plod off to find some snacks. One more woman climbs into the bus before it leaves. We drive around town in a long, careful circle, before arriving back at the place where we began. Several more people climb on. We wait. 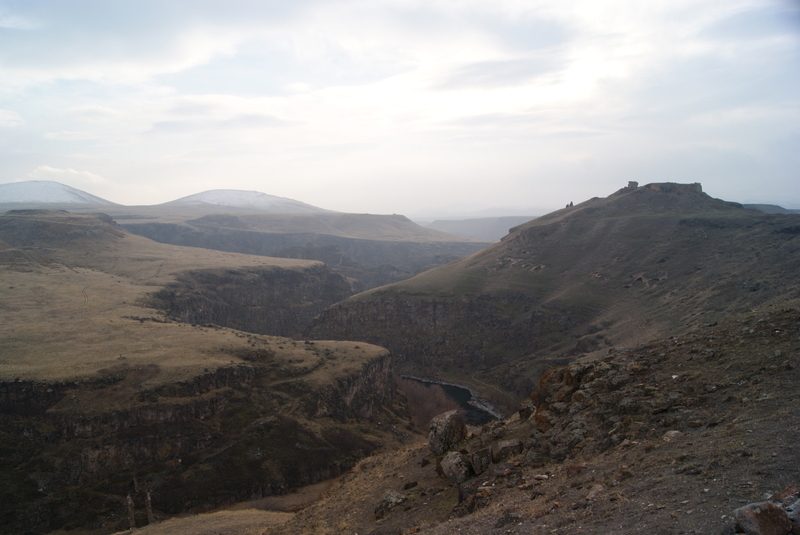 We finally leave the city just before 2pm and set off along the forty-five kilometre road to Ani. I glance at my watch anxiously. In this part of the world it gets dark at 3:30pm. At this rate, we’re only going to have thirty minutes of daylight, and how will we hitchhike back again on this long freezing road without any light? My phone battery is low and we haven’t thought to bring a torch, food, or even much water. We begin thinking that this was all a very bad idea indeed. The bus stops by a tiny shop and three people get off the bus, including the driver. My anxiety is rising. “What time Ani?” I ask the driver in Turkish when he comes out. Everybody gets back on the bus. Somebody hands us some sweets and another man gives us a small plastic cup of cola each. I begin to relax. Whatever happens, people will look after us. True to the driver’s word, we arrive at Ani soon enough. I notice nobody on the bus has mentioned that there isn’t a bus back again. This fills me with a little hope. “Return bus exist?” I ask. Apparently so, but only one. We have to hurry. We go to the entrance booth where two guards sit, bored. “Otostop?” one of them asks me, the international word for hitchhiking. “Otobus!” I tell him. He raises his eyebrows and points at his watch. “45 minutes bus?” I ask him. He looks doubtful. It seems impossible that this was once a city of 100,000–200,000 people. Where did they all live, and what did they do for a living? At the height of its glory, Ani was known as the “City of 1001 Churches,” and its many religious buildings, palaces, and fortifications were amongst the most technically and artistically advanced structures in the world. 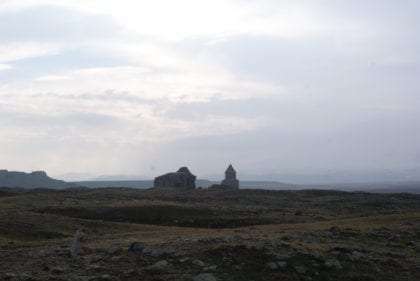 Now it is only ruins, lying in this half forgotten coldest corner of Anatolia, almost within jumping distance of the modern state of Armenia, but separated by a chasm. The border between these two nations has been closed since 1993, when Turkey closed the border. This is why we had to hitchhike through Georgia, rather than hopping over the gulf. There are a handful of other tourists wandering around. We see as much as we can with an eye on my watch, then hurry back to the main entrance and loiter hopefully in the parking area outside. A girl comes to speak to us. She and her two friends are also trying to get back to Kars, and have been given different information to us. She invites us to join them. We climb into one bus minibus, with a driver that complains all of the short drive to a village school nearby. Apparently, he isn’t too keen for us to come along with them. The girl, who speaks English, tells me it’s because the bus we’re taking next is a school bus, and he’s not supposed to take tourists there, but I hear a lot of words relating to money. “Only for bread, only for bread” he says many times. She scolds him. “She speaks Turkish! She speaks Turkish!” they cry. “Where are you from?” one boy asks Hrach. Hrach pauses. “Ermenistan,” he tells them. The kids howl with laughter, as though this is some kind of hilarious joke. “Ermenistan! Ermeni!” the boy crows. “This is my husband,” I tell the boy, who shuts up immediately. I wonder what these kids have been told about Armenia. Perhaps they think of it as something from long ago, or a kind of myth, not a very real country only a stone’s throw from their village. “Comşu,” I tell the kid, pointing at Hrach. He’s your neighbour.